Be a hero. Warning: going to this page could make you a better person. Netiquette If you use e-mail, you have to know what you're doing. 10 great wines for under $10. Why everyone doesn't have this FREE fax service I don't know. My list of over 300 music CD's, along with my rant about why CD swapping and downloading music is OK. If you see anything you like, let me know (don't worry, I'll leave the RIAA something in my will). Let's trade! Get broadband for the love of pizza! Want to know the best way to download music from the Web? Hands down, its Limewire, the heir apparent to Napster. Read why I think you really ought to have this FREE program. My favorite little program is called Dave's Search Bar. It sits quietly in your system tray and saves you time by making it easy to search the web (just type in an item or web site and hit Enter), access a calendar (just right-click), or any of hundreds of other time-savers. It doesn't take up much room because it replaces your clock. I use it 50 to 100 times a day. Most online newsletters are worthless, but there is one that stands out: Langalist. 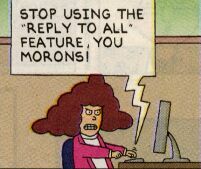 It's hardware and software information for everyone. It regularly receives the highest ratings by industry magazines and is always a good use of your time. Click Here to sign up for FREE. For 14 cents an issue, go ahead and get the PLUS edition. It's worth every penny. Frustrated with the high cost of inkjet cartridges? Me too. I found a place with the best prices (sometimes less than half Office Depot's), a 100% guarantee, free shipping, no tax, and fantastic service. Really. Visit their web site, or, better yet, call their friendly staff: 1-888-465-7765. They're open 10:00 to 7:00 EST. The best boxed chocolate values. The Grinch letter. If you're addicted to the status quo, keep away. Ellen Feiss commercial for Apple. I have no idea why I like this so much, but it's definitely worth seeing. Also, check out the amazing song (called iSwitch) inspired by the commercial, and the article about her. 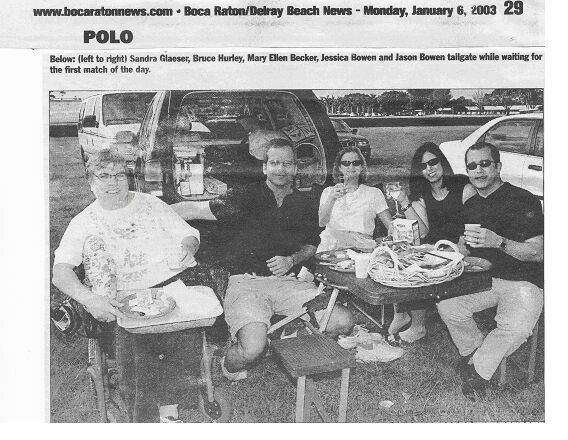 Newspaper photograph of Bruce, Mary Ellen, Sandra, Jason and Jessica enjoying a tailgate party at the polo matches in Boca. A ZIP program to uncompress files. Adobe Acrobat Reader to view PDF files like The Grinch Letter. Windows Media Player for audio and video (PC only). Flash Plug-in to view special multimedia content.